So you’ve decided that you want a home/desktop 3D printer. But like the early days of personal computers, there’s been an explosion of different 3D printers out on the market. There’s about 120 different desktop 3D printers available in 2013. Until the market decides on clear winners, there will be more to come. Which 3D printer should you buy? That mostly depends on why you’re buying one and your budget. Since there’s different printers all the time, any review or recommendation given here would quickly be outdated. It’s better to learn what you need to know about buying a 3D printer, learn some tips, and make your decision based on that. Am I going to have more fun building the printer, or printing things? How consistent is the printer, and what’s the quality of the prints? Do you want to tinker with the hardware, or are you more interested in printing things you or other people designed? Some people are drawn to 3D printing because they like hardware or mechanical machines and would like to build their own from scratch, from kits, or design one of their own. For them, the fun of it all is the actually building of the machine. Many of the kit-based 3D printersare also open source, meaning the design and the bill of materials is available for you to make changes to the design and contribute changes back. To save on costs, it’s also possible to source the materials yourself through online suppliers, such as McMaster-Carr, Amazon Supply, and eBay. If you fall into this group, it’s best to focus on printers that come as kits, low cost, with a relatively large community to ask questions when you run into snags. Hang out at various 3D printing communities on google groups or google plus, and see what 3D printers people are talking about. The RepRap family of 3D printers are the poster child for DIY 3D printing. Specifically, the MendelMax 1.5 comes to mind, as a DIY 3D printer that’s pretty solid as well as easy to assemble. Other people are drawn to 3D printing because the ability to build anything they can imagine–or better yet, things that other people imagine. For them, the fun is to explore what you’d be able to print with a 3D printer. Some people print functional art and desktop ornaments. Other people use it to prototype board game pieces, hardware enclosures, or product concepts. And yet other people print functional objects to fix and solve their problems around the house. Or do you like to print things? If you fall into this group, it’s best to focus ease of use, consistency and speed of prints. This will mean you buy pre-assembled 3D printers, with some semblance of customer support. 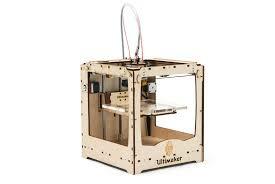 Makerbot Replicator 2 and Ultimaker are the two commonly purchased pre-asssembled printers. For Makerbot Replicator 2’s, you may be able to get a printer with a similar performance for a lower price. The cost you’re willing to pay for a 3D printer will figure heavily into what kind of printer you will buy. As a rule of thumb, kit-based printers are cheaper than pre-assembled printers, and self-sourced printers are cheaper than kit-based printers. However, there are solid pre-assembled printers available for $500 to $800. 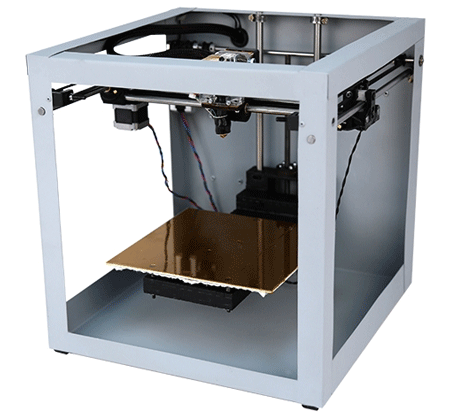 As of 2013, you should be able to get a good pre-assembled printer with for around $1500 or less. For $2000+ printers, look for something that makes it stand out from the sub $2000 printers. Examples are one or more of the following: solid metal frames, a flat build platform, speed of print, belt-less drives, straight metal guides, easy to use software. The Solidoodle and the Printrbot Jr are two prime examples of value 3D printers with reportedly consistently good prints for a low price. There’s many things that factor into ease of use (the software for one). However, consistency of the print is one of the biggest contributing factors. Early desktop 3D printers had easily failed prints, and there’s nothing more frustrating than restarting a print. As of 2013, failed prints are far more rare, but they still do happen, largely due to the design of the printer. First factor in consistency is the flatness and the levelness of the build platform. 3D printers regularly print at layer heights of 0.1mm, which means that if there’s warping in the build platform of more than 0.1mm, the first layer isn’t going to stick well in different places. Then, it’s likely going to peel off and warp the print, or worse, get knocked off the platform. The best way to discover if a printer has this issue is to view their community or support forums, and see how many people complain about it, and how the company responded to it. Secondly, all desktop (as well as most commercial printers) 3D printers are open feedback systems, meaning there’s no feedback back to the onboard computer where the toolhead is once the computer issues the command to move to a position. The ability to travel to the same point in 3D space consistently therefore depends on a combination of stepper motors, a solid frame, drive systems, and the overall design of the printer. Printers with a solid metal frame will tend to vibrate less when printing at high speeds, so there will be less resonating waves that show up in the prints. Printers with a direct drive system or leadscrew drive system, as opposed to a belt and pulley drive system tend to have backlash when changing directions, and hence a more accurate X-Y resolution. (To be fair, leadscrews also have a bit of backlash). The Ultimaker (assembled: $2k+, kit: $1.5k) and the Type-A Machines Series 1 (assembled: $1.5k) have both been rated as pretty accurate machines. Generally, there are two measures of print speed. There’s the print speed–how fast the toolhead moves when it’s laying down plastic. And there’s the travel speed–how fast the toolhead moves when it’s moving between printing areas without laying down plastic. Many 3D printers now employ acceleration/deceleration firmware on the toolheads to achieve higher print speeds. The toolhead’s path often consists of abruptly changing directions, and without acceleration, it would shake the 3D printer apart at high speeds. For example, the Makerbot Replicator’s official print speed is 40 mm/s, but I’ve been able to run it at 80 mm/s with acceleration without a decrease in print quality. Notable speedy printers are the Ultimaker ($2k+, kit: $1.5k) and the TrinityOne Aluminatus Pro ($3k+), both clocking in at around 400 mm/s. 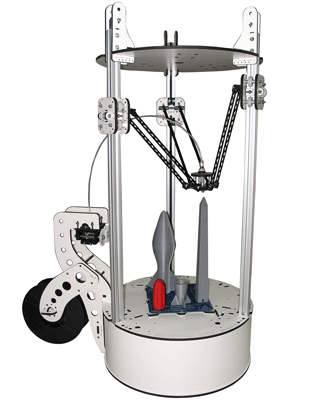 Delta printers are based on pick and place robot designs that tend to have really fast performance. The Rostock Max (kit: $999) clocks in at 300 mm/s, and as evident by pick and place machines, they can only get faster. The first delta printer to arrive on the scene with a significant following is the Original Rostock by Johann Rocholl. His next iteration is the Kossel. Decades of closedness and sitting on patents by commercial 3D printing companies haven’t seen much progress in the desktop 3D printing space. As a result, many in the 3D printing community value openness and the sharing of ideas, progress, and credit. If this is a value you share, you might want to buy 3D printers that support it. 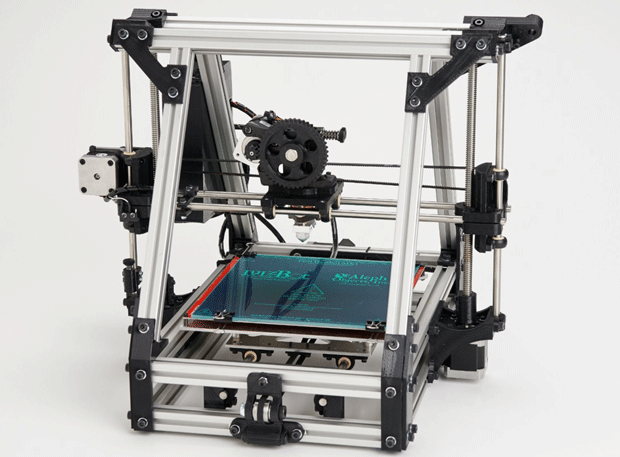 Lulzbot AO-10x series is based on the MendelMax, which in turn is based off of RepRap family of machines. They’re open about their support for the open source 3D printing community, especially after Makerbot closed the source of their new Replicator 2 when their previous printers have been open source. The community has had nothing but good things to say about the company’s customer support, and involvement in the community. The community around a 3D printer is also important, especially if you’re building it from a kit. For any printer you’re about to buy, see if you can find an active community discussing the printer and whether the company has a good customer support system in place. There’s a large misconception on the resolution needed for an object to be useful. Some people imagine something wouldn’t be useful or beautiful unless an object looks like injection molded parts. That’s simply not true. Today’s desktop printers can easily achieve 100-150 microns layer heights. While the grain of the print is still visible, it feels like running your fingers up a stack of fine paper. 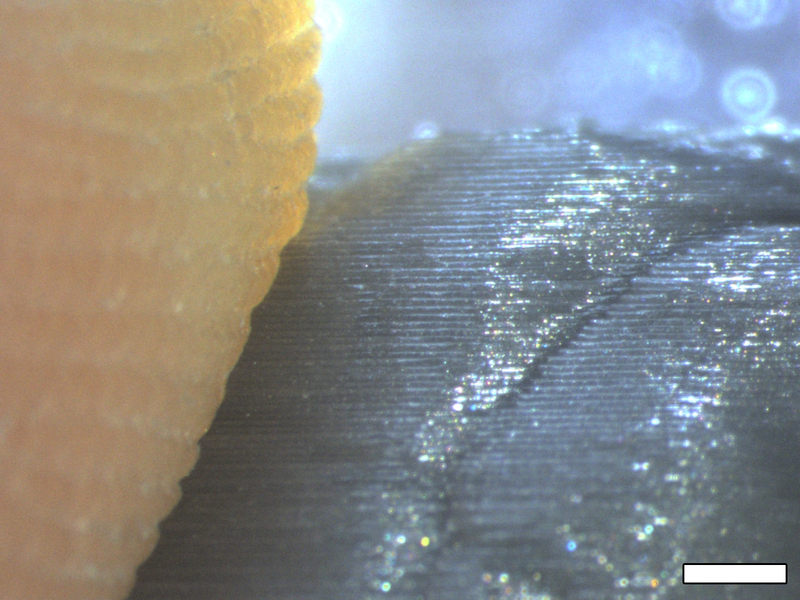 Hobbyists have also been able to achieve 20 micron prints. The orange thing you see on the left side of the picture is someone’s thumb. However with Fused Deposition Modeling (FDM) printers, the higher the resolution of the print, the more time the print will take to finish. There’s a a couple stereolithography (SL) desktop printer on the market right now. One is the Form One, and the other is the B9Creator. Its resolution is unmatched by FDM machines, but it requires a post-processing step to harden the print. The build volume is a specs often touted in the marketing materials of various 3D printers, but in reality, beyond a certain size, it’s a feature with diminishing returns. The advantage of having a huge build volume is that you can print large parts without having to digitally cleave the model. In addition, you can also print lots of different parts at once. Since most 3D printed parts of any significant size takes hours to print, most people print medium sized objects. Given that your build platform can accommodate most objects, beyond a certain size (200mm x 200mm) it a feature with diminishing returns. For desktop printers, there’s only a few plastics in use, ABS and PLA. Most 3D printers use filament spools that are interchangeable. The only exception is the Cubify Cube from 3D Systems, which require special Cubify only cartridges, even though it’s still ABS. So unless you have a Cubify printer, there’s no lock-in of plastic filament between different printers. So unlike inkjet printers, the materials is relatively cheap. ABS and PLA plastic filament is around $30-$50/kg, which will probably last you two months even if you print regularly. I personally have found Octave Filament to be a good source for filament, and they also sell through Amazon. The cost in 3D printing is not the materials, but the time it takes to print things. Weighed against your budget, you should try to get the fastest printer you can afford. Almost all desktop 3D printers are FDM printers. This is because the patent for FDM printers has expired in 2009. Notable exceptions are Form One SL printer and the PDWR powder-based printer. Unless you specifically need an SL or powder-based printer, most desktop printers are FDM printers. By now, you should know what to look for in a 3D printer. Further references to help guide your decision is, The Ultimate Guide To 3D Printing. It costs money, but well worth the money for their in-depth reviews. You would also do well to check out Engadget’s buying guide if you’re still reading this in 2013. Good luck in your search for a 3D printer, and lemme know if this guide helped at all. I found this post from the Invention Studio in Georgia tech, where they operate a small farm of 3D printers. They inadvertently have reviews of all the printers they operate for reliability. So far, the LulzBots AO-10x comes out on top for them. Host your 3D printable models on Cubehero. Follow me on twitter. Our SeeMeCNC Rostock MAX isn’t in that picture, that is a picture of a closed-source design on kickstarter, that has taken advantage of the OSHW communities work, and failed to follow some of the ‘rules’ of living and working in an open source community. Our Rostock MAX can be seen on our website, seemecnc.com and all the design files, cad files etc… can be found on the reprap wiki pages as well as from us. I’m interested in a printer under $2000. I just want to print, I don’t want to build the printer, and I value precision over speed. What are the top 2 or 3 you’d look at? Thanks! Hey there, for a sub $2k printer valued towards precision, I’ve heard good things about the Alfinia H-Series printer, the Type-A Machines Series 1, and the Lulzbot AO-10x series. I went with the Afinia H-Series, and it’s great for nice, clean builds without a lot of fiddling. When you throw it in Fine mode, with 0.15 or 0.2 mm layers, you get really clean builds. $1500, and their tech support is pretty great (responses within an hour, usually). Holy cow this is awesome. I didn’t even know these existed. Is it bad I want to get one just so I can do the skull you have pictured? It would make me feel like an artist, almost. This is a huge jump in technology. (In my opinion at least.) Great post! One topic briefly covered was materials. I see things like jewelry being printed with stainless steel and other materials. Are these types of things available in desktop models or would you have to go with something more industrial? Great article. Thanks for sharing your knowledge. No current desktop model supports metal. The only one that has plans to do so right now is pwdr, but that’s in the early stages of development as of this writing. But all hope is not lost. You can submit your models to Shapeways, and they’ll use their industrial printers to ship a printed object in metal for you. Thanks for this useful post. I’d just think it is worth mentioning the huge build volume of the Type A Machines Series 1 (9 x 9 x 9′) – indeed an interesting feature fo a $1400 3D printer! I’m wanting to print scaled model trains. Here is an example of what I mean http://eahobby.com/images/ACU1209.jpg They are about 2″ tall. Would any printers sub 3k be able to print to that level of detail? Many earlier cars had wooden paneling, and these injection-mold made models even have wood grain detail. $3k is plenty of budget for a 3D printer. The ones in the $2k range can easily print at 100 micron layer heights (looks like a stack of paper). Also, you may need to design the train in pieces and then put it together after it’s printed. In short, the printer should be able create the details you want, but 1) there will be stripes, unless you do post processing 2) you’ll need to print it in parts and put it together. What you leave outside of the picture is software. Some printers come with all you need on cd rom, others leave you to sort out. And if you do not know how to edit firmware en re-upload through arduino IDE and that sort of stuff, you may have a problem. You help is then found in the reprap forums, which are highly technical. How about for more of a final product? Our main requirement is printing low-tolerance but decently smooth black ABS and clear PC complex (with overhangs) consumer parts for underwater use in sunlight, with up to 5 parts per day capacity, and with the lowest materials cost possible (hopefully less than $20 each). Parts are between 7″ cubed and 12″ cubed, and 30 to 200 cc’s each. Max production would be about 100 units per month. If it needs to be water tight, I recommend you use injection molded parts. You probably need to get multiple 3D printers to get 100 units / month of a part that size. 3D printing is slow. It shouldn’t be used for production parts on anything big, unless you have multiple 3D printers. Not water tight, but just underwater. The injection people all gave a “no quote” because they were unable to make these parts. Multiple printers is probably a good idea for backup and multi-project printing. What I am not understanding is the difference between the desktop printers at 100 micron resolution and 200 mm/s speed (and cheap materials), and Stratasys Dimension printers at ten times the cost but much less resolution and apparently slower speed. Support material will be needed for the complex designs, too. Hi there! Great article! Would it be possible to print around an object? In a way that the object would be left inside and undamaged, so that it could be recuperated if the print was broken? I am seeking to purchase a 3D printer for a specific idea. I started off by researching the CandyFab because I liked the idea of being able to work with a sustainable and ecological “material” like sugar. I wouldn’t want to work with metal or plastic. I wanted materials like sugar or porcelain, something that can break. For the size I wanted to be able to print an object up to 30cm high, I don’t know if that is qualified as medium or big. Oh. like a fortune cookie? Yes, it would be possible, but you’d have to re-make the toolhead’s nozzle length to be at least the size of the object, because otherwise the toolhead’s platform would hit the object. Or if it’s like a kinder egg, you can print half the egg, put the object in, and then if the object is only half the size of the egg, you can pause the print, put in the object, and then resume to print to entomb it. However, it also means you have to monitor the printing of the object to stop it in order to put the object in. I think eventually 3D printers will add a pick and place arm to put things inside of prints, but so far, there are no desktop 3D printers that do this. Thanks for the comprehensive review! Just what i needed. Could you recommend me a decent 3D printer under $2000. My priorities are high speed and the biggest build envelope size possible. Not in particular. You need to look at what I covered and decide which is aspect is important to you. I recommend reading the Make Guide to 3D printers that I reference at the end of the blog post. Good luck! Our Series 1 was rated “Best in Class” by Make: Magazine for biggest build volume (10′ x 9′ x 9′), reliability and yeld. We just released the new version, available at the same price of $1,400 until the end of the month! Ping us at info@typeamachines.com for more info! Great article. Thanks! One important point you don’t make is the distinction between printers that require support for “overhangs” (and that includes most of the consumer-oriented printers you describe) and those that don’t (mostly professional-level machines). I’m betting the skull in the second photo was not done on a consumer-level machine. Their method of operation requires that every element of the object must rest directly on something lower down—a major constraint on what they can print. The only available work-around for a basic machine is to include temporary supports in the design. The user needs to cut these off after the printing is done. Thanks! It’s easy to forget what’s considered common knowledge, and which aren’t, when you’ve done something for a while. I’m shocked there aren’t many 3D print shops out in the world yet. I would have thought that business minded folks would have jumped on this. This is the future, and it is here, now. Shocking. I am curious how much society has thought through the implications of all of this – namely, I would think 3D printers have (or soon will have) the capability of “printing” guns and other weaponry. This would put the creation of weapons of varying sorts into the hands of all folk, a thought I find rather frightening. Similarly, 3D printing could, over time and as production costs come down, render manufacturing in general moot. I think there are many societal implications to this. I find it surprising – and perhaps even troubling – that an ongoing discussion of 3D printers and the implications/impact they will have on society have not become a part of the wider, societial dialogue. Then again, I suppose that society in general does not do a very good job of examining and digesting the impact of technology on the well-being of society. The guy from defense distributed is working on printing an ar15 as we speak, this will be in addition to the “liberator” pistol he has already created. I don’t think the government will like it too much when anyone can print an ar15. It’ll be a long way before those guns are as effective as a barrel that you get at home depot, or one you machine yourself. That said, the potential is there, but material engineering needs to get much much better. I think the potential for 3D printing is making things that we couldn’t make easily/well/at all before. The issue is a matter of exploring what that might be. I think with new technologies, people usually don’t know what to do with it. The overly optimistic make guesses that are usually wrong or too far into the future, and the overly cynical simply can’t see why one would use it in the near future. In truth, why I believe in 3D printing is because it allows you to do things you couldn’t do well/easily/at all before. That’s what makes it hard to see what it’ll actually be good at. It’s still early in some sense–the only people that make money off of 3D printing are the people that make 3D printers, the people that print things for others, and people that sell filament. That’s not to say there aren’t other ways, but the market is still maturing, and people are trying. As for 3D printed weapons, that’ll still be pretty far off. Materials engineering needs to give 3D printing a boost before that will be a significant threat in the traditional sense. But that said, it may be that 3D printers will print new kinds of weapons that are threats in new ways–such as all plastic weapons that are not detectable by traditional means. The technology is still in primary phase with high expectation in future. 3D printers are already available on the market but the list with objects taht can be built with these is still very low. Fantastic article. Clear, concise, and I can see a dedication and passsion to helping others through a reply to almost every comment. I didnt see much mentioned in the any articles about printers with the ability to change materials (for structure or aesthetics). Only thing I could think to point out. Any recommendations on the best quality printer in the $1000-$2000 range for prototyping? I wouldn’t mind building from a kit, but would like it to be complete so I don’t have to go shopping around for parts! People seem to like Ultimaker, deltabot, or lulzbot’s printers in that price range. hi Laura, have a look at the new Series 1: $1,695 fully assembled, rated best in class by Make Magazine! First of all, thank you for such an insightful article and for continuing to respond to all of these posts so long after the article was written. This has been very helpful. I am considering purchasing a 3d printer to use with Architectural models, I am willing to pay $3-4k for a good printer but it needs to be able to print in color. Can you give me any recommendations? Thank you. No problem! No current home desktop 3D printer is able to print in multiple colors. The only ones I’ve seen are ones that people hacked up themselves to mix different filaments. If you need to be able to print in full color, you may need to use an industrial 3D printer. However, those are still quite expensive, and above your price range. However, you might be able to use shapeways.com, where you upload a 3D model, and they print it out for you on commercial printers. I know they farm out to different local 3D printers, so you may be able to find a 3D printer near you with commerical printers to lower the costs for whatever you need to print. Hope that helps! Thank you for the very helpful article. The company I work for has put me in charge to decide which 3D printer we should order for our models we will be building. Our company wants to build models of houses and print them with the 3D printer to be able to display to investors. Our price range is anywhere up to $3k and our priorities are build volume and speed. 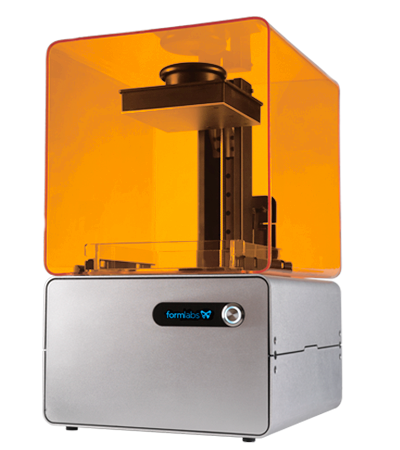 Which 3D printer that is available now do you think would be best? thanks so much again. of any widgets I could add to my blog that automatically tweedt my newest twitter updates. have some experience with omething like this. Please let mee knokw if you run into anything. How about a generic question? If I need a certain amount of strength, a hole drilled in a flat object 3D printed, with pulling strength of xxlbs of force before breaking, who would I put this question to? Are you aware of any printers in the $1000-1500 range that could print a sunglass lens? I dig that skull in the article above. Does anyone have the file for that project? Printers would be of very high resolution and smooth prints. The printing process is usually quicker than with FDM filament models. The provided in formations are useful. Thanks for sharing it. to encourage yourself to continue your great writing, have a nice holiday weekend!